The trash to treasure class at our two ELI Centers is always fun and adventurous. From making a decorative cone from newspapers to coming up with a translation table, the students demonstrated their creativity and intention to have recourse to recycling to protect the environment. Moreover, in the class I always try to merge learning with creativity. At our Riviere du Rempart center, I try to merge an English lesson with the recycling class. For instance, one class was dedicated to recycling of newspapers. Through that class I could successfully include some lessons of translation from English to French and vice-versa. 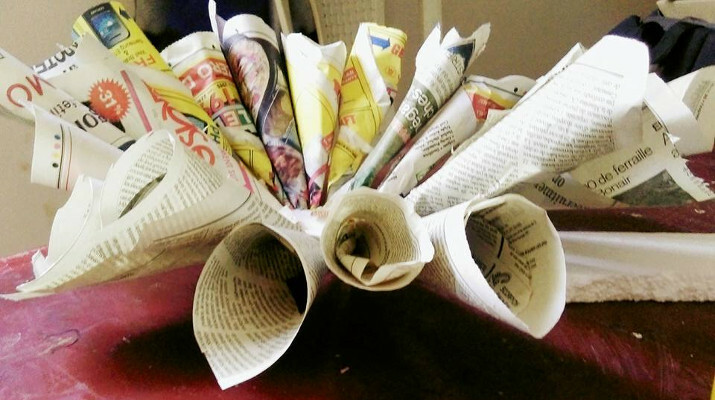 The students started by cutting old newspapers to come up with a decoration using cones made from the newspaper pieces. Through that process, I told them to cut out words that they are familiar with from both French and English newspapers. They then translated the words on their own and made a chart using the words. Besides recycling, they got to enhance their vocabulary during the trash to treasure class. Each recycling class is an opportunity to come up with something creative which will not only benefit the environment but also the students. Previous StoryELI Corps-A Path Worth Treading! Next StoryELI Africa Fundraising Raffle-A Success!